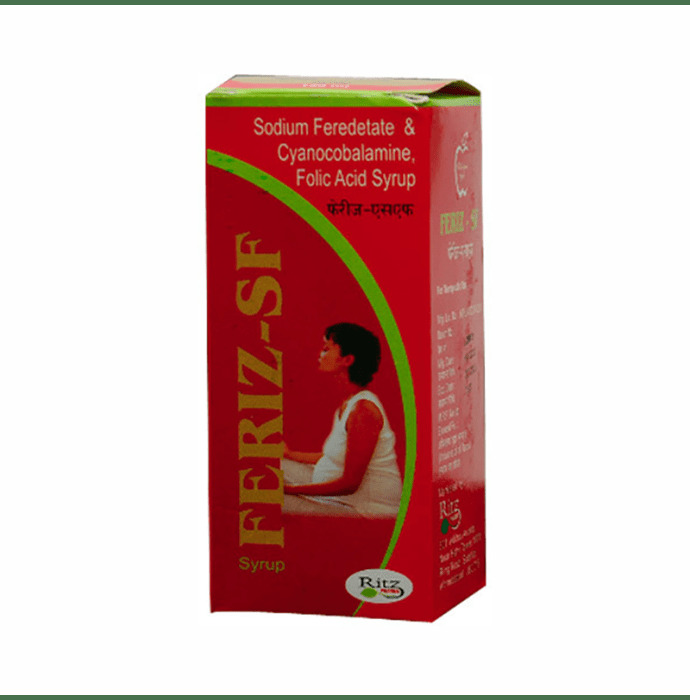 Feriz SF Syrup contains Sodium feredetate. Feriz SF Syrup is recommended in Anemia, a condition that develops when the blood lacks enough healthy red blood cells or haemoglobin. Sodium feredetate contains iron that is combined with a chemical called EDTA to make sodium feredetate. This is an unionised form of iron and not an iron salt. Sodium feredetate breaks down in the gut and releases the iron, which is then absorbed by the body. This unionised form of iron is less likely to cause stomach upsets or discolour teeth than that of iron supplements that contain iron salts, like ferrous sulfate. Feriz SF improves the patients condition by working as a dietary supplement to fulfill the iron deficiencies and regulate oxygen in the blood, producing and maturing the red blood cells. It is used in the treatment of iron deficiency anemia, anemia during pregnancy and severe blood loss. 301,302,303 , Aditraj Arcade,Near Hetvi Tower, 100 Feet Ring Road, Satellite, Ahmedabad, Gujarat - 380015.